This image was developed from a glass plate negative probably taken at the end of the 19th century. The photographer was standing on the west bank of the Genesee River, above the Lower Falls. 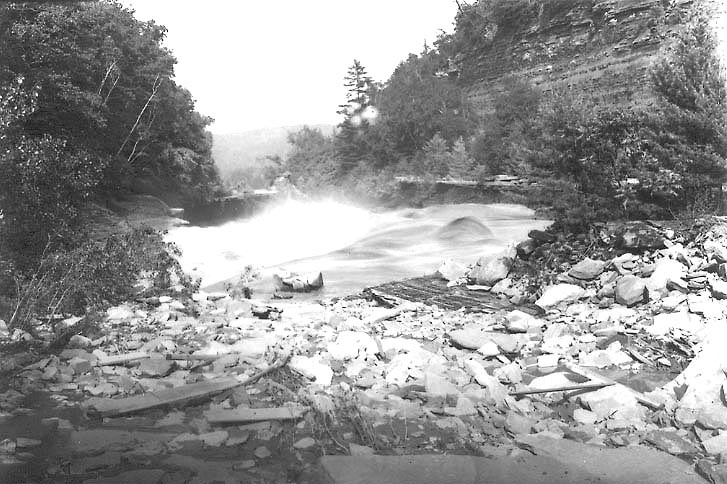 Looking toward the North, the first rapids of the Falls is visible, with the water churning into the narrows of the Flume. In the distance is Table Rock and the top of the "Sugar Loaf". For more information, see our other views of the Lower Falls. We thank Teagan DeRue, a student in Mr. Kevin Raymond's photography class at Keshequa Central School, for developing the image for us!